I designed this board for fun after the Digispark and, subsequentally, the Adafruit Trinket were announced. The motivation was to have my own ATtiny85 based development board based on a USB bootloader and optimized for the ubiquitous 170 point mini-breadboards. In contrast to the Digispark it even sports a reset button. However, it lacks an integrated voltage converter as it is supposed to be powered by USB. As you can see below, the Nanite is very narrow, wasting no space on the breadboard. It is only 0.4″ wide in contrast to the 0.5″ or 0.6″ of the Trinket or Olimexino. In fact the pin configuration is exactly the same as that of a DIP ATtiny85. 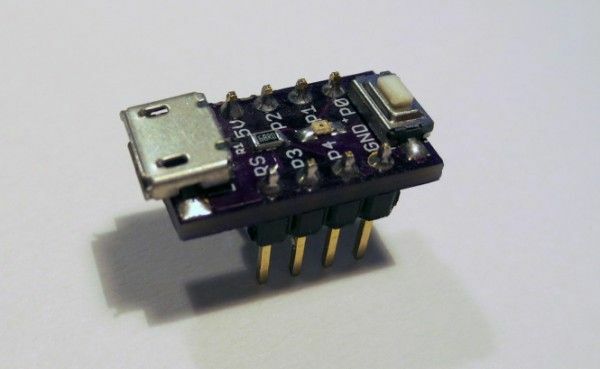 You can use the board for development and replace it with a DIP ATtiny85 when you are done. So, how does it compare to the Olimexino 85s? The table below lists the size of both boards. Looks like the Nanite is almost 20% smaller. Yay! So much about worlds smallest. Removing the reset button from the Nanite could reduce the length further. But who wants a board without reset button? Why is it that small? The picture below shows the main idea behind this: The controller is mounted on the bottom of the board in a 90 degree orientation. Apart from the size considerations, the Nanite also uses a neat circuit trick to share a single pin with the LED and the reset button. The circuit of the board is shown below, the circuit attached to the reset pin, PB5, is to the right. If PB5 is configured as reset (this is the standard configuration), the push button will simply act as a reset button and the LED acts as pull up for the reset button. It will of course light up while the button is pushed. If reset is disabled and PB5 is configured as a normal I/O pin, the state of the button can be polled by simply reading from the port. The LED can be turned on by setting the output to ‘low’, and is turned off by configuring the output into a high impedance state. It is not advised to set the output ‘high’, since in that case the pushbutton could short the output to ground.